Insurance companies can seem to have their own language at times, and when both your health and your money are on the line it’s important to understand what’s happening. Below are some health insurance basics, and see “Glossary” and “Common Insurance Questions” for more help with the complicated world of insurance. Medical insurance typically works like this – you have a monthly premium that you pay to keep your coverage active. You also have a deductible, which is how much you pay on your own before your insurance begins paying the percentage agree upon (the coinsurance). That percentage amount will depend upon which plan you select (bronze, silver, gold, platinum, catastrophic). That arrangement will continue until you reach your out-of-pocket maximum, the absolute most you can pay out of your own pocket for your healthcare for that year. For example, Linda is 35 and just bought a Blue Cross Blue Shield Silver insurance for herself via the Affordable Care Act. She has a $500 deductible and a $700 out-of-pocket maximum. Her insurance premium is $65 per month. There are 5 categories or “metal levels” of coverage in the Marketplace. 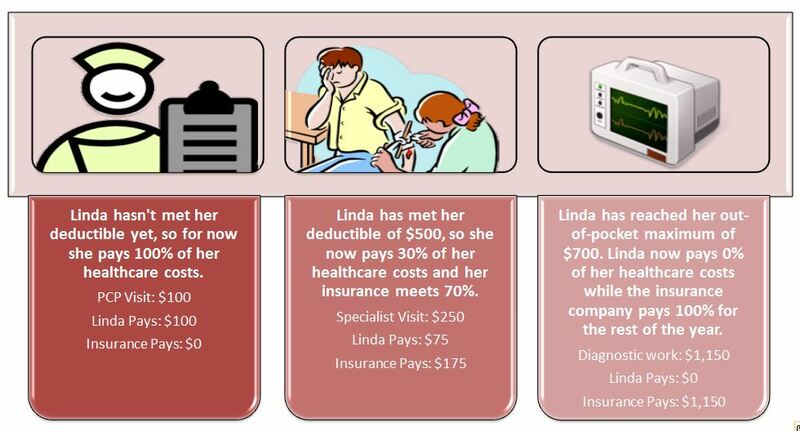 Plans in each category pay different amounts of the total costs of an average person’s care. This takes into account the plans’ monthly premiums, deductibles, copayments, coinsurance, and out-of-pocket maximums. The actual percentage you’ll pay in total or per service will depend on the services you use during the year.